Okay, I hope you're ready for a recipe full of carbs! I normally wouldn't put pasta and potatoes together in the same dish, but the New York marathon is coming up this weekend, so I figured something carb-heavy was appropriate in honor of those running. Personally, I know I'll never reach the level of athleticism of a marathon runner, but the carbo-loading part? That I can handle =). This recipe is another one from the November issue of Food & Wine which I've been cooking a lot from lately. It's described as "peasant food" - simple, tasty, and filling. 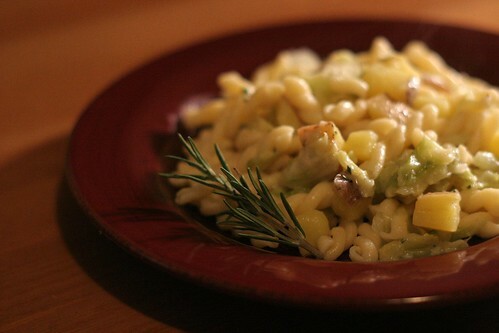 The pasta is tossed with steamed cabbage and potatoes, and a sauce that is flavored with garlic, rosemary, thyme, and cheese. 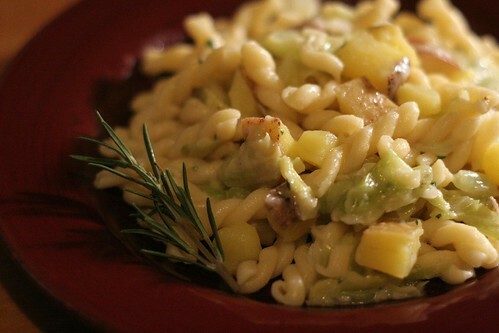 It's a nice rustic dish that is perfect comfort food for colder weather. The original recipe calls for buckwheat or whole wheat penne. I opted to use regular gemelli instead, because I don't like the whole wheat penne that is sold at my grocery store (it doesn't hold its shape well and always falls apart) - if you have a brand that you like, please let me know! Bring a large pot of well-salted water to a boil and cook pasta until al dente. Reserve 1 1/2 cups of pasta cooking water and then drain the pasta into a colander. Meanwhile, heat 1 inch of water in another pot. Spread the cabbage in a steamer basket, top with the potatoes, and set the basket over the pot. Cover the basket and steam the vegetables until very tender, about 10-15 minutes. After draining the pasta, melt the butter in the pasta pot. Add the 2 cloves of sliced garlic and cook over moderate heat, stirring, until the garlic is golden brown, about 2 minutes. Add the cabbage, potatoes, rosemary, and thyme, and season with salt and pepper (I found that this dish works well with a lot of pepper). Cook for 2 minutes. Add the pasta and the 1 1/2 cups reserved cooking water and cook, stirring, until the sauce is thick, about 2 minutes. Remove pasta from heat and stir in the cheeses and minced garlic clove until ingredients are well combined. Season further with salt and pepper if necessary and serve with extra Parmigiano-Reggiano, finely grated. wow, these pictures are gorgeous! Is this just in daylight! Haha I LOVE the idea of carb loading in sympathy for the marathoners! 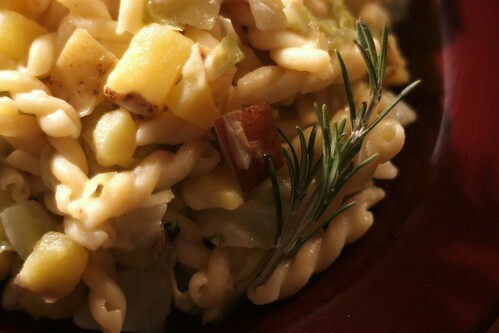 This pasta with cabbage and potatoes sounds like a perfect, and healthy, way to go!